I have set October 31st as the target date for completion of my Trimsos Project - that is, all the units and terrain needed for a re-fight of Donald Featherstone's 'Battle of Trimsos'. The rules I have been developing are quite playable as they are, but of course will continue to be altered as play testing continues. I know, never set targets for a hobby project. But I reckon I'm nearly there. One of the reasons for optimism is that I have been helped over my painting wall by a bit of sub-contracting. Stuart has been waxing lyrical recently over the painting he's doing for some of his new projects, and so I caught him in a good mood and asked if he might find time to paint something for me. A good humoured but slightly sideways look resulted, but soon a price was agreed. The guy really is on a roll at the moment - in about a week I was able to collect the figures from his house - a 2 minute drive instead of paying P&P! Now, painting standards for wargames figures can be a delicate subject. We might look at some figures and think they are a bit underpainted (or even, perish the thought, badly painted), though we would probably be polite enough to say nothing. My own painting standard I would assess as at the better end of underpainted. I have also stated my personal opinion, in a post a while back, that wargames figures can also be overpainted, an opinion which was vociferously challenged in a number of comments. 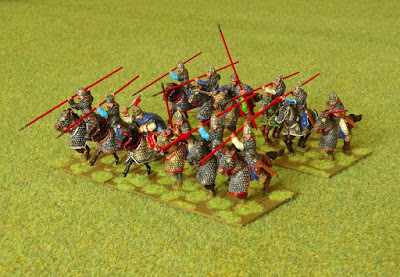 Well, let me just say that the unit of cataphracts I now have in my collection is what I would describe as just right. Colourful but not garish, detailed but not pointlessly so, impressive whether seen at wargames ranges or picked up and examined. Oh, and Stuart's suggestion to paint the kontos red was inspired. Note that no two figures are the same - here is a unit that looks elite and proud of it. 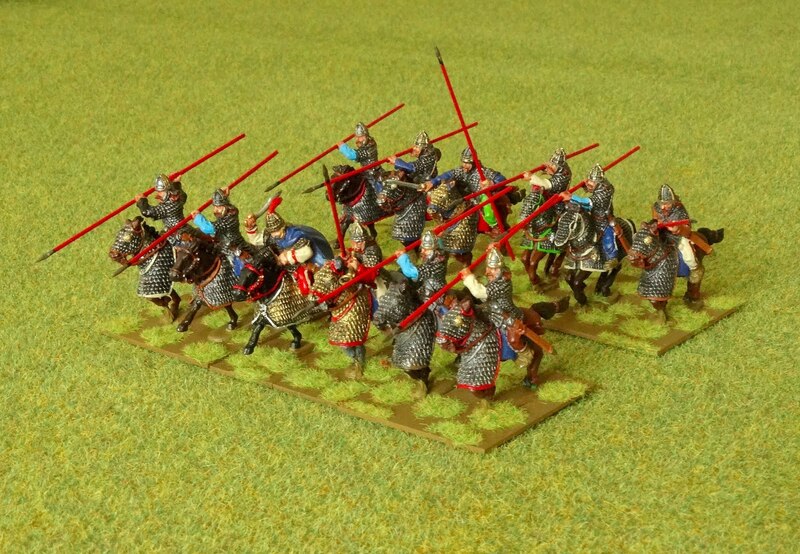 For the record these are Warlord Games Sarmatian Cataphracts, in 28mm of course. Can't wait to get these guys into action. 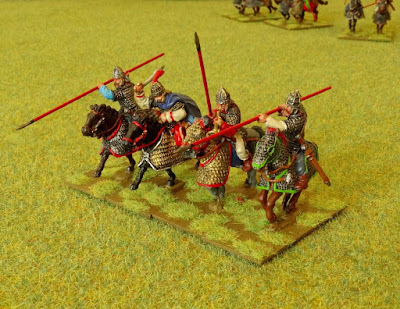 Do you think 'The Goldilocks Cataphracts' might be a bit too whimsical a name for these chaps? Not quite martial enough perhaps? Edit: 'Goldilocks' in latin = 'Auricomus' (masculine). 'Auricomus Cataphracts' has a certain ring to it, I think. 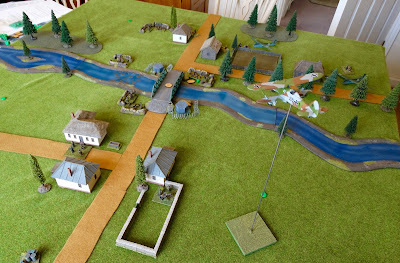 And so good fortune presented me with a free morning to set up and fight out the airborne assault scenario I had developed, with the intention of trying out the rules for glider and parachute landings recently published in Battlegroup Tobruk. 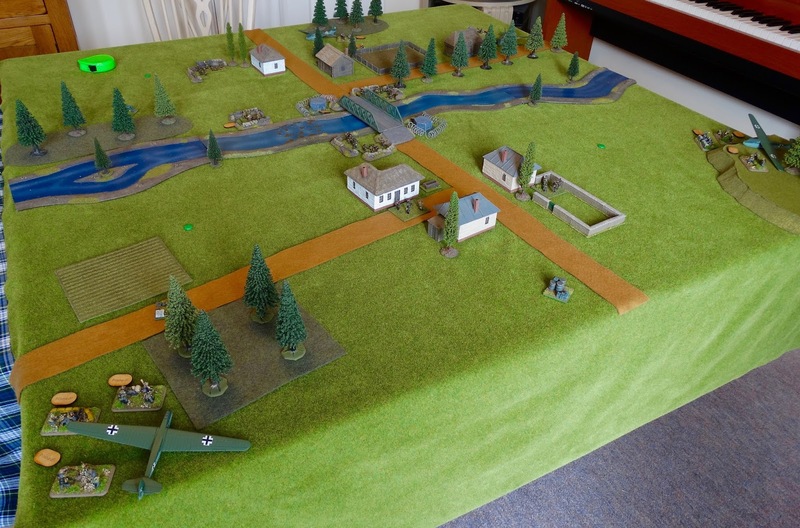 Now Battlegroup (like most contemporary rules, especially the WW2 ones) benefit from being played regularly. Whilst basically simple, there are quite a few fiddly bits to get the hang of, and if you haven't played for a while there can be some time-consuming searching through the rules for re-familiarisation. Such was my experience for this game, with the added problem of using the completely new rules for airborne landings. The new rules I found pretty good. They seem to have the right balance of frustration and 'feel', which gives a good impression of the things that can go both right and wrong during an opposed glider and parachute assault. What was particularly interesting was that my modest game (platoon level, about 400 points per side) was resolved in just three moves. They were three quite lengthy moves (about 45 minutes each) due to my rusty Battlegroup skills, but nevertheless the relatively high Battle Rating of the Germans was rapidly eroded as gliders crashed, Fallschirmjäger dropped into the river, and Polish fire took its toll. The scenario as described in my original post provided a pretty tight game, with the Poles exceeding their Battle Rating in German turn 3, whilst the Germans themselves had lost 34 of their original 35 BR. One surprise was how quickly the 2 pillboxes fell - with a cover save of 2+ for the occupants, these are usually tough nuts to crack. But some intense small arms fire linked to a run of 1s emptied one pillbox, whilst the other was silenced by placing a very handy 'ammo low' card on top of it. 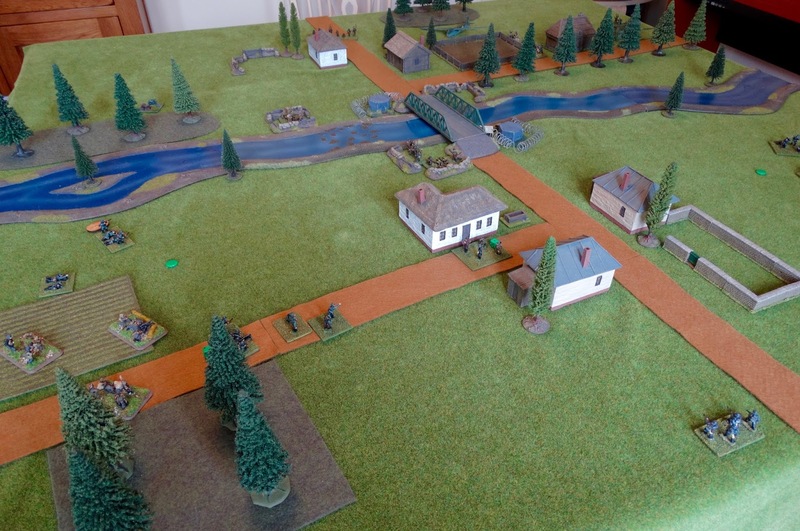 Flamethrowers are really fearsome weapons in Battlegroup, provided you can get them into range, and a Polish squad was quickly wiped out by such a discharge. They would have been ideal to clear the pillboxes, but in the end weren't needed. The counters taken for being under flamethrower fire and being under air attack were very useful in eroding Polish strength. Below are a few pictures to give you a feel for the terrain - 15mm miniatures of course. 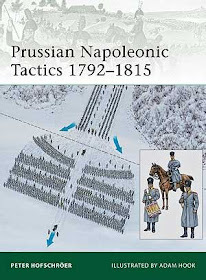 The only changes I would make to the scenario as presented in my previous post would be to give just 20" of trenches to the Poles (more isn't needed), and reduce the number of HS-123 strikes to 1 to balance the points. I would also restrict the 'Alarm' special rule to 2 turns in this particular case. I didn't use the 'Red Shines The Sun!' special rule either. With veteran and elite Germans facing inexperienced Poles, the superiority in German morale didn't need extra boosting. The overall set up and the position after German turn 1. One glider was destroyed, and of the other 3 only 1 made a perfect landing. Polish positions around the bridge. The only glider to land exactly as planned. I mistakenly marked the occupants as 'pinned' at first, as you can see. In fact they were entitled to receive orders straight away. 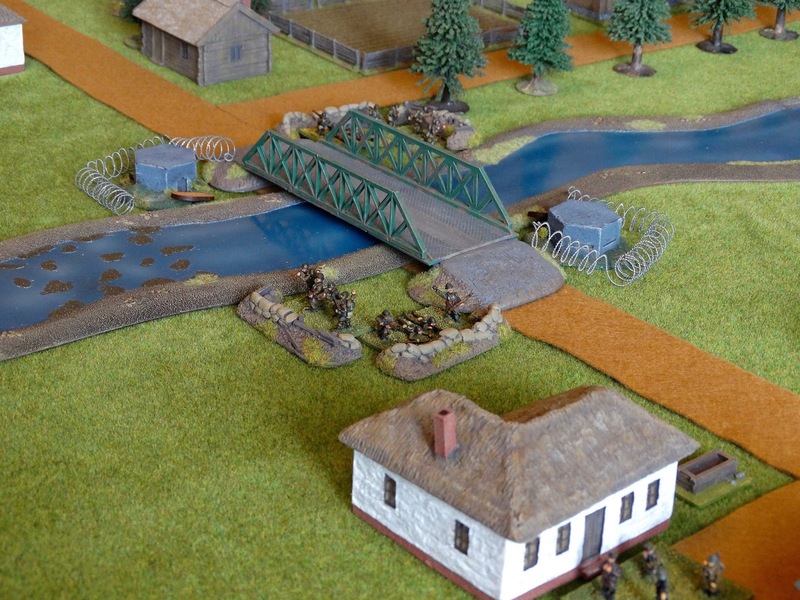 The HS-123 strikes were effective in pinning some of the Polish units around the bridge. 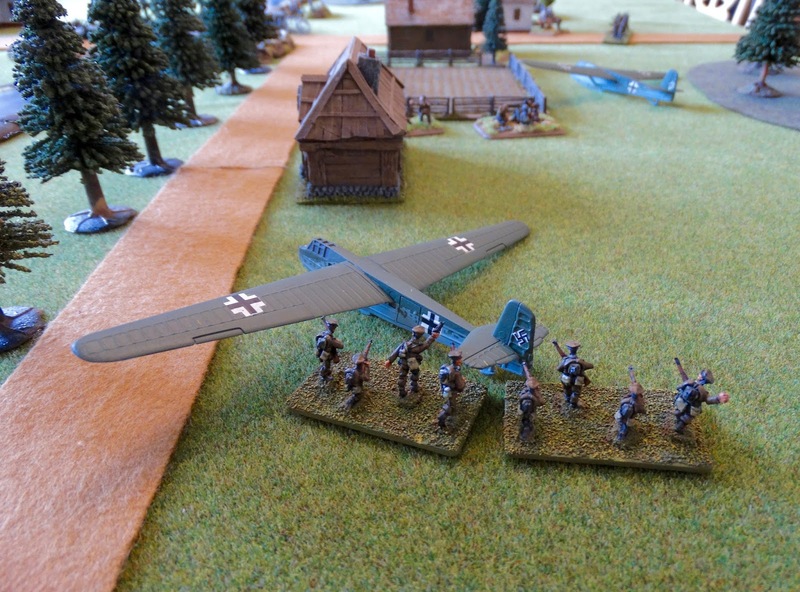 Polish reinforcements arriving on turn 2 advance past an abandoned glider. Final positions. 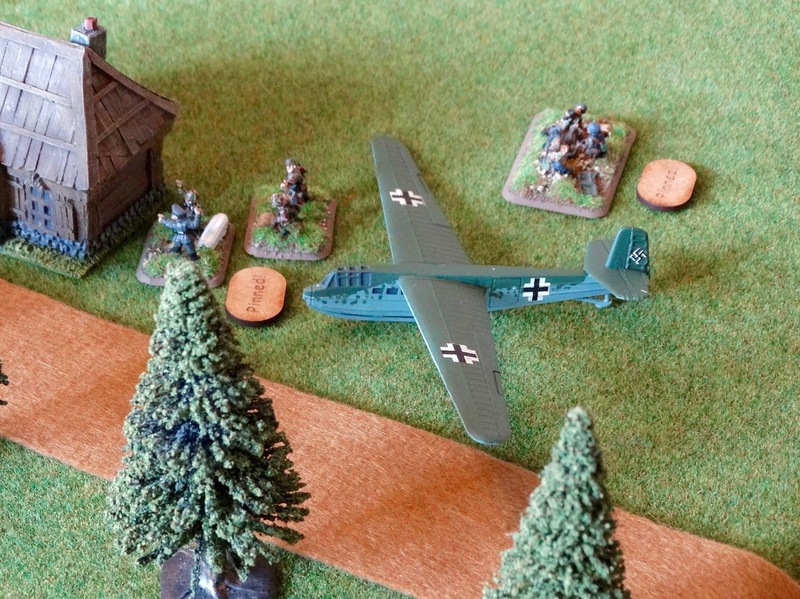 A 'drop canister objective' has been captured by a German squad (bottom right), which won the game. This particular rule is a clever abstraction of the critical nature of paratroops (especially German ones) having to retrieve supply canisters after a drop. I'm looking forward to giving these rules another try, perhaps in a bigger game featuring air-landing troops. Perhaps this project from 2013 would be a good one to resurrect. In the unlikely event anyone is interested, I would represent transport planes landing under fire during a Battlegroup game in the same way as glider landings, but make them a bit more likely to land safely. So the dice rolls become 1-destroyed, 2-3 rough landing, 4-6 perfect landing. Thus the better chance of a good arrival (due to being powered aircraft using an airfield or prepared strip) is represented.